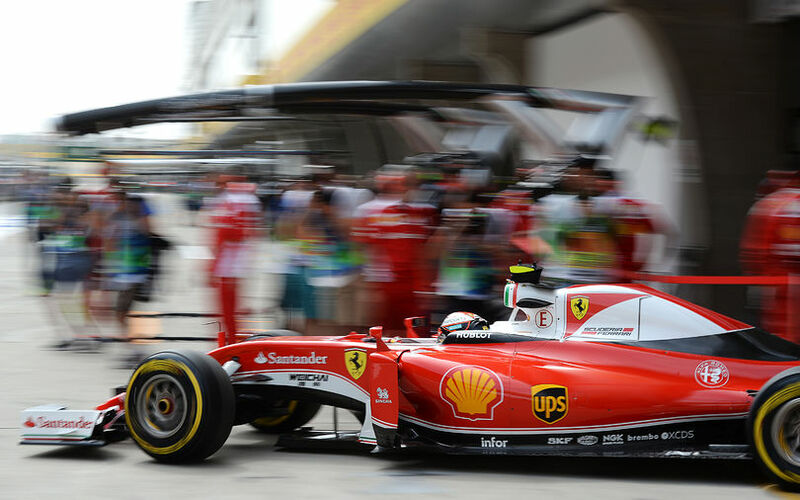 It has recently emerged that Turbulet Jet Ignition (TJI), and not HCCI, is one of the key technologies that Scuderia Ferrari is using in Formula One engines to push the power unit's efficiency further forward. All compressor charge air must be used for combustion within the engine, by regulation. Off throttle gas flow can be increased/energized via late ignition, avoiding piston power while maintaining turbine power somewhat. I don't know how commonly that is done, if at all. As I feared, I look a dik now LOL I'm used to it. If for instance there was sufficient valve overlap, would that not allow (relatively) cooler air into the hot exhaust. Would this be enough? Nothing wrong with the question, and I misspoke, actually. All air entering the compressor, and fuel exiting the injectors, must exit through the exhaust pipe. So there's nothing regulating valve overlap effects, and conceivably you could dump charge air directly into the exhaust. No photographic evidence of pipework to support this ever being done. So long as the charge air is sufficiently heated by the ICE, there will be enough energy available in the exhaust stream to power the turbine and sustain the compressor. If there is too much dilution (too much charge air) then turbine power alone won't be able to sustain the compressor power requirements, and the H will have to consume electricity to make up for the difference. In these engines compressor work and intercooling might be the main limiting factor for air:fuel ratios, in-cylinder dilution, and any valve-overlap/out-cylinder dilution. With enough overlap there would be the opportunity to energize gas flow destined for the turbine under any regime. Ignition is limited to five sparks per cycle, but there are no limits to injection events, only fuel mass flow. In the 2.4l v8 era both "HOT" and "COLD" blowing terms were in voge. both were possible and used by means of mapping that manipulating the throttle/s butterflys separatly from the throttle pedel. that throttle butterflys/throttle pedal manipulation is no longer allowed. any turbo air charge no matter the valves overlap must first go past an open throttle butterfly. Honestly, what they have been able to do with the hybrid tech is probably the single most road-relevant technology from the last 20 years. All of which begs the question (at least to my mind): if engine manufacturers are able to generate so much electrical energy without additional fuel (or, now, oil), why would you write regulations that make it so convoluted to use that eenergy, often pushing development more in the direction of improved combustion? For road relevance/green credentials, wouldn’t it make more sense to limit only the ICE specification and fuel allowance, and allow teams to generate as much power as possible from that? Would that not increase fuel efficiency? You could then conceivably then gradually reduce fuel allowances (preferably also reducing weight to help), which is both a great PR story and keeps the PU a relevant part of the car. Front wheel regenaration will open a way to 4wd car which is not good like 3 pu for whole season. Don’t have any position on this personally but just interested to understand why 4wd is not good? Wouldn't that make overtaking harder? If anything I would have thought easier - greater proportion of overall grips coming from the mechanical aspect, no? However he seemed to liken it to the 3 PU rule, so wondering if he thinks it’s a reliability issue somehow? Some want to develop efficient ICEs. Some want to develop hybrids and EVs. Ok, so in that case, you can still develop the ICE’s output in current regs - so check! - but you can’t really do that with the electrical energy output without going to these extremely complicated (and not road relevant - you’d never design it this way without the regulation) solutions - so no check. Seems lopsided and counter to the whole purpose of creating ‘green’ engine regs. It is against of Formula 1 car's soul. It must be rwd, peak of power and tech and a bit expencive. I am sure nobody accept it. I thought F1's "soul" was too too be the most technologically advanced racing series on the planet? Arbitrarily forcing 2WD when tech has proven that AWD is faster (Porche 919) makes no sense to me. Agree about 1:1 increase in compressor to turbine work. But using a turboexpander to help lower intake air temperature (along with smaller intercooler(s)) could have the benefit of extra electricity. Would go a ways in explaining the rule change about inlet temps being no less than 10* above ambient.